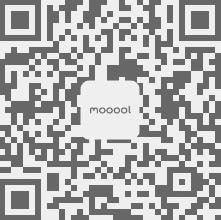 Thanks nARCHITECTS for authorizing the publication of the project on mooool, Text description provided by nARCHITECTS. 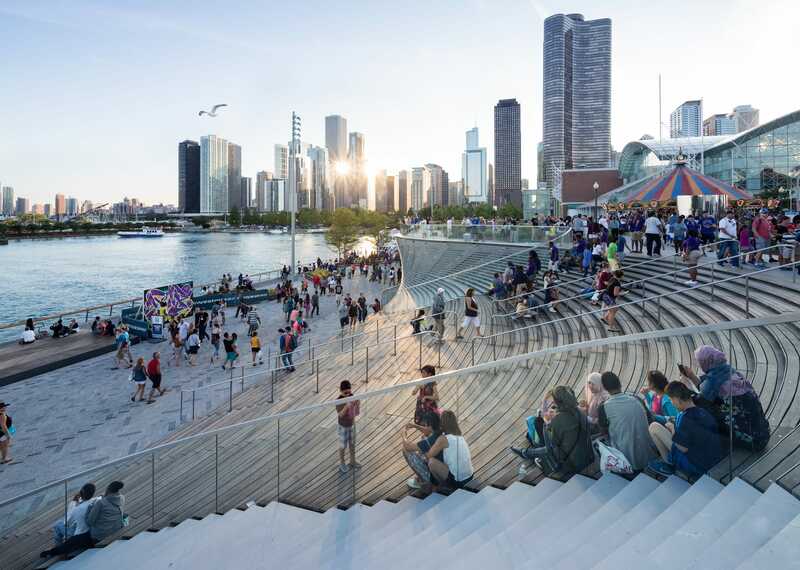 nARCHITECTS：nARCHITECTS is part of the winning team led by James Corner Field Operations for Pierscape, the redesign of Chicago’s Navy Pier, Illinois’ most popular tourist attraction. 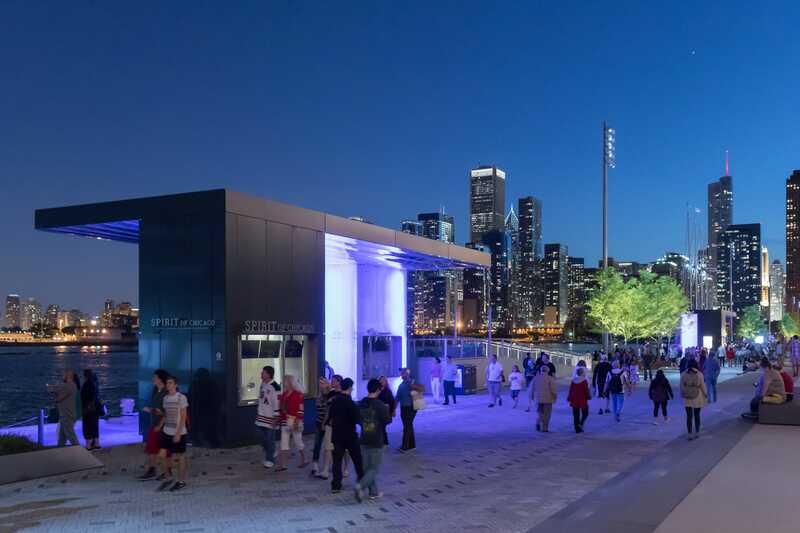 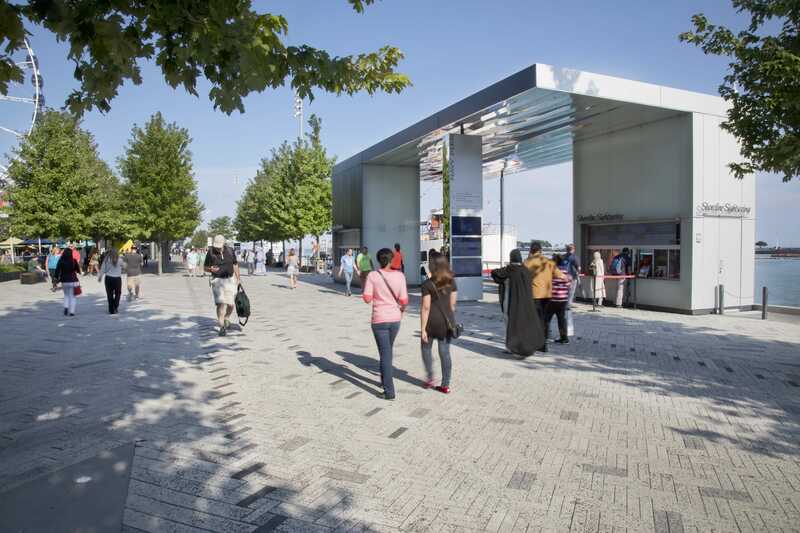 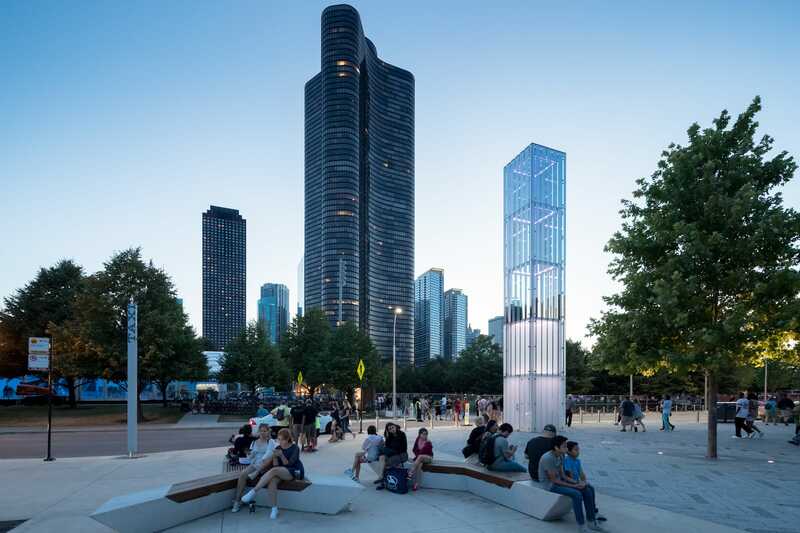 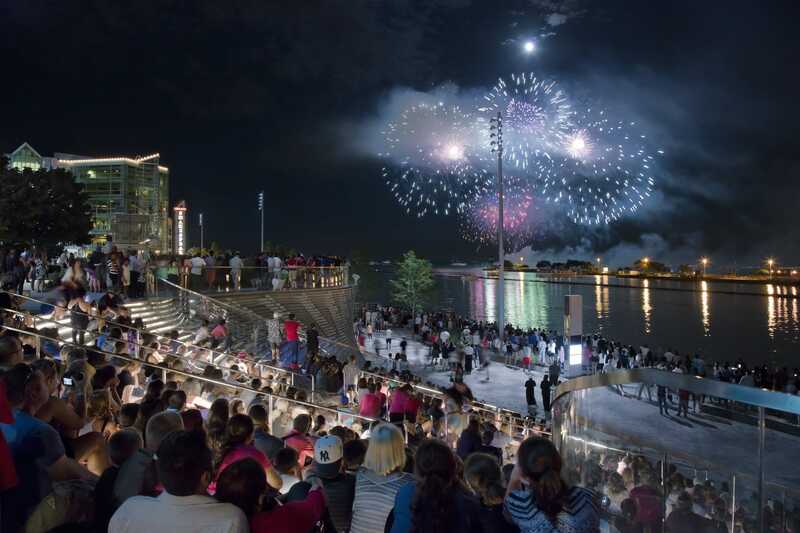 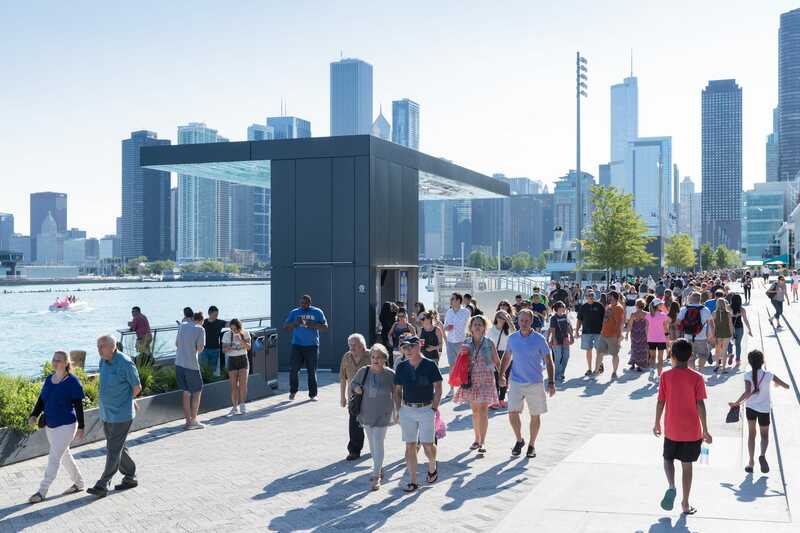 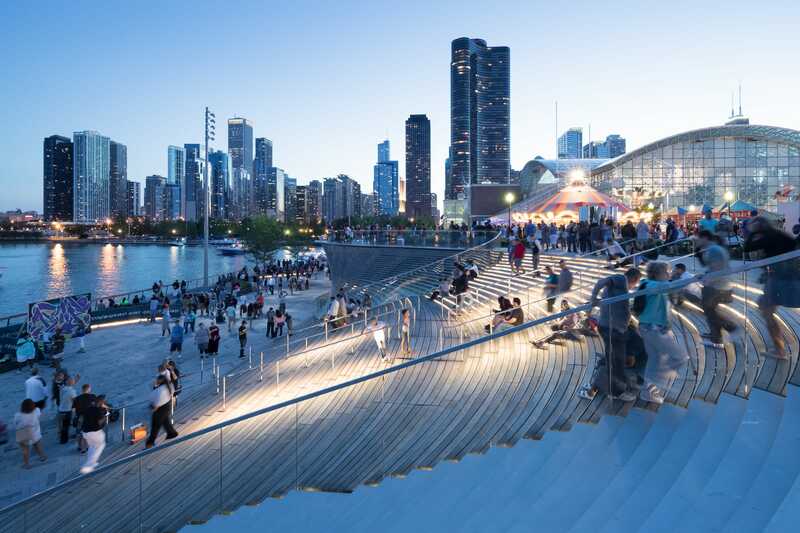 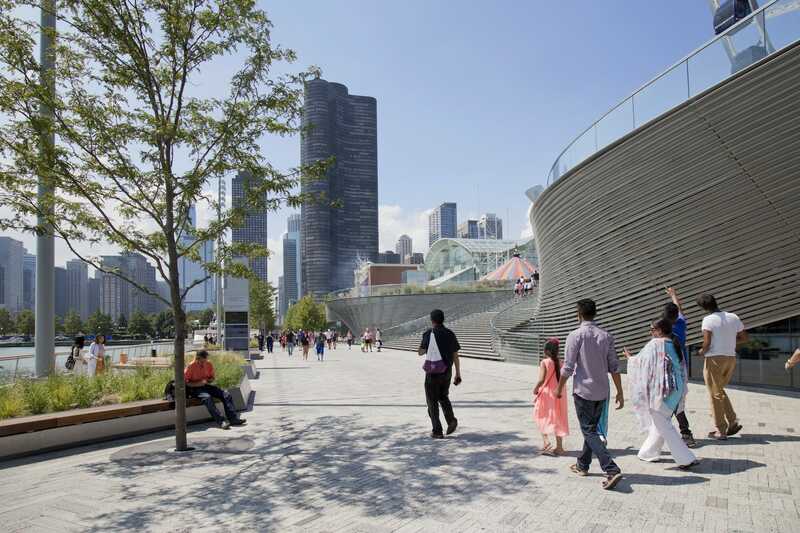 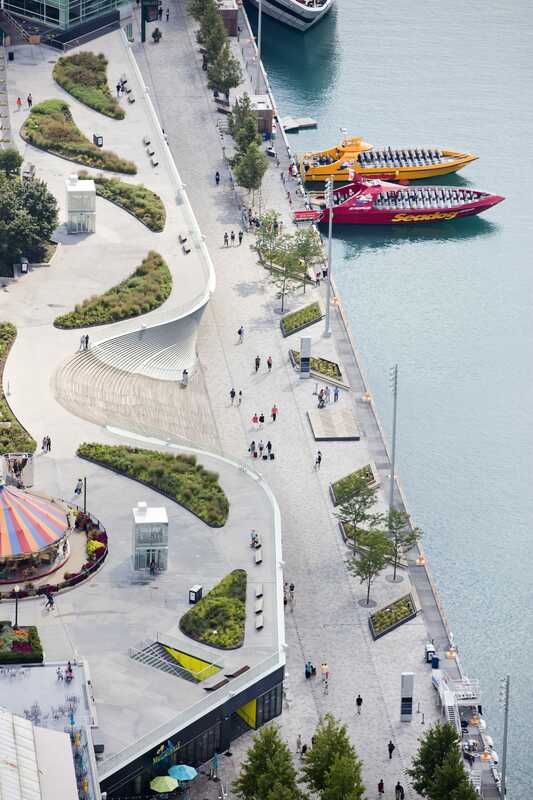 Pierscape reactivates the public realm of Navy Pier as a vibrant social and recreational space, as well as connecting the pier back to the city. 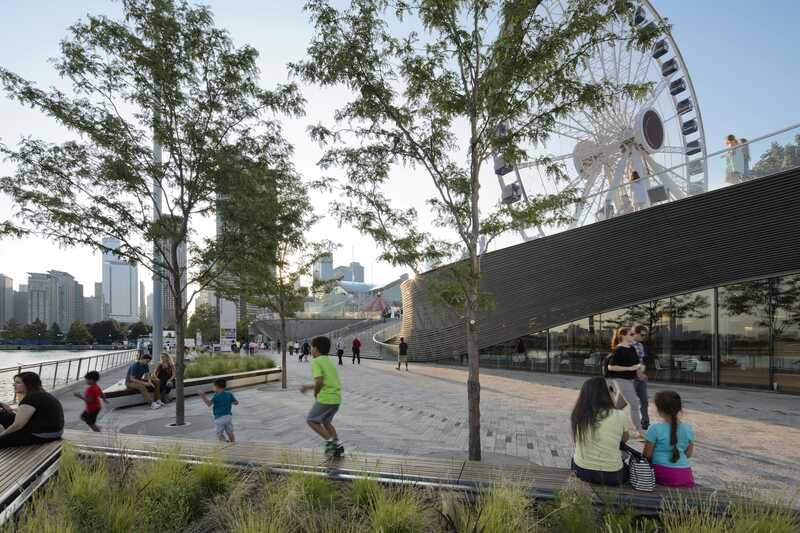 As the architects on the team, nARCHITECTS collaborated on the overall plan and designed structures that enhance Chicagoans’ connection to the lake by framing, integrating or reflecting the natural environment. 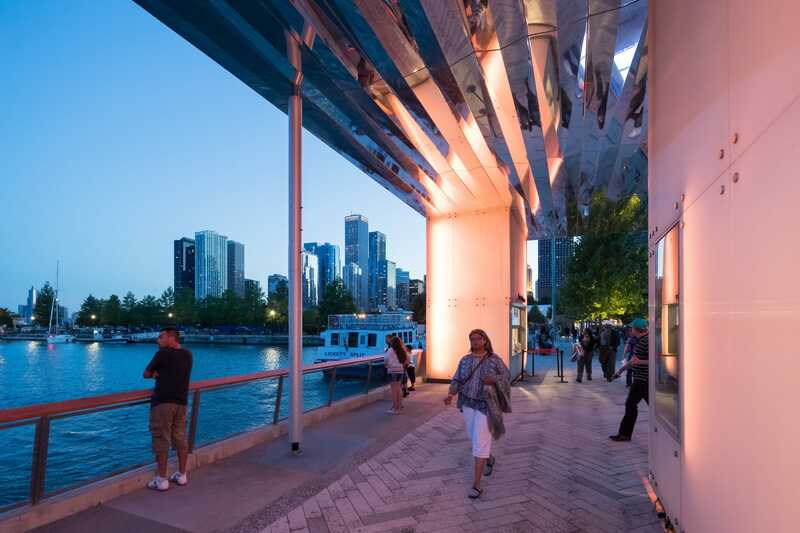 The architecture of Pierscape is organized into two categories and scales: large singular structures that merge buildings with landscape and smaller objects that punctuate the pier and frame new views towards Lake Michigan. 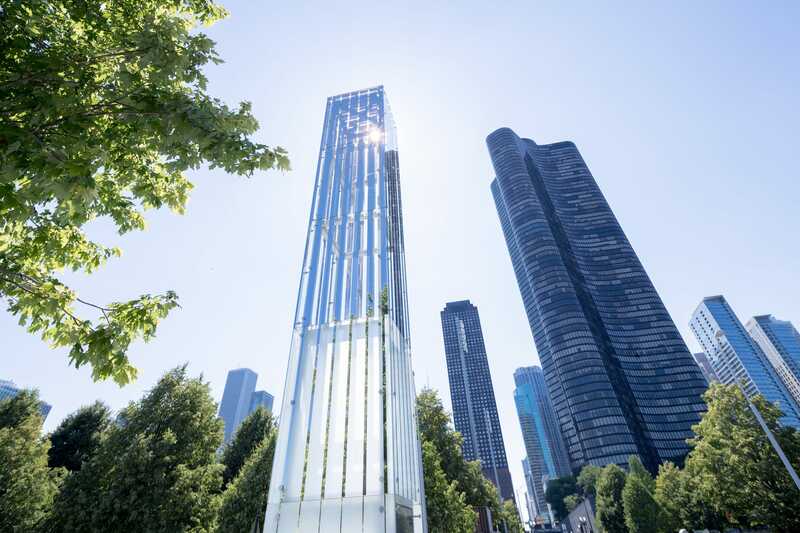 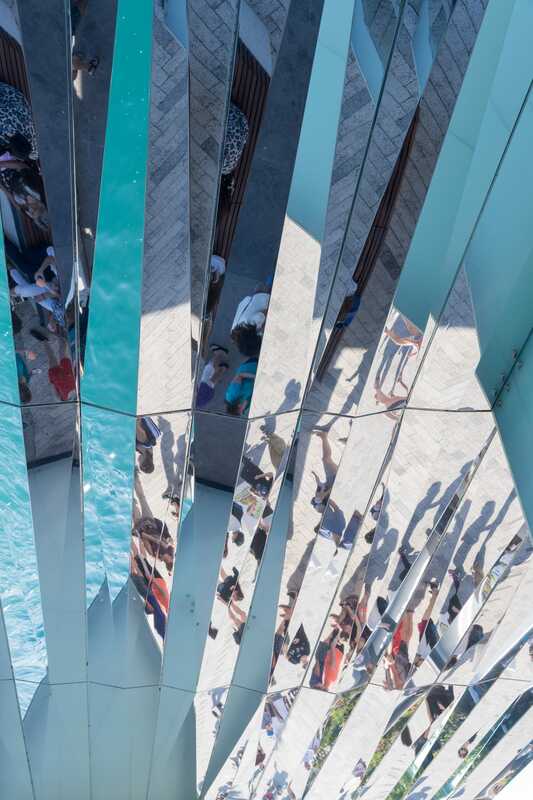 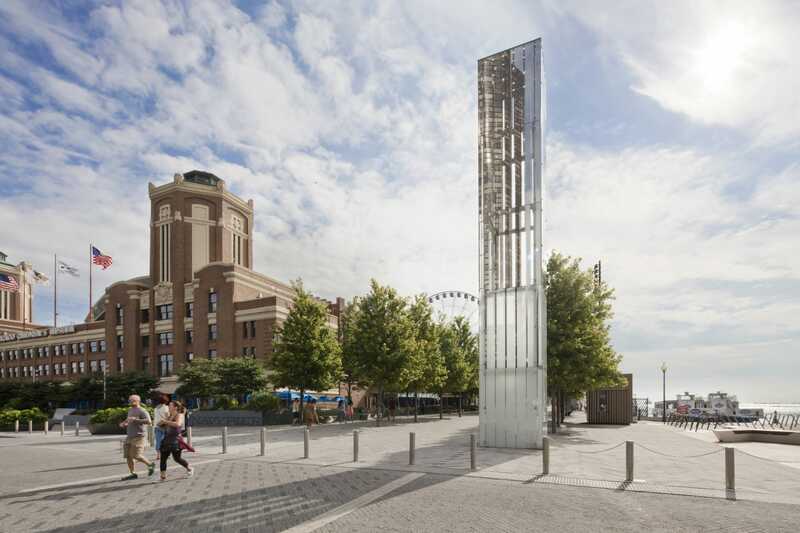 To mark the beginning of the pier, nARCHITECTS designed the Info Tower as a dynamic urban beacon clad in glass with a reflective chrome pattern that reflects the sky and pier activity. 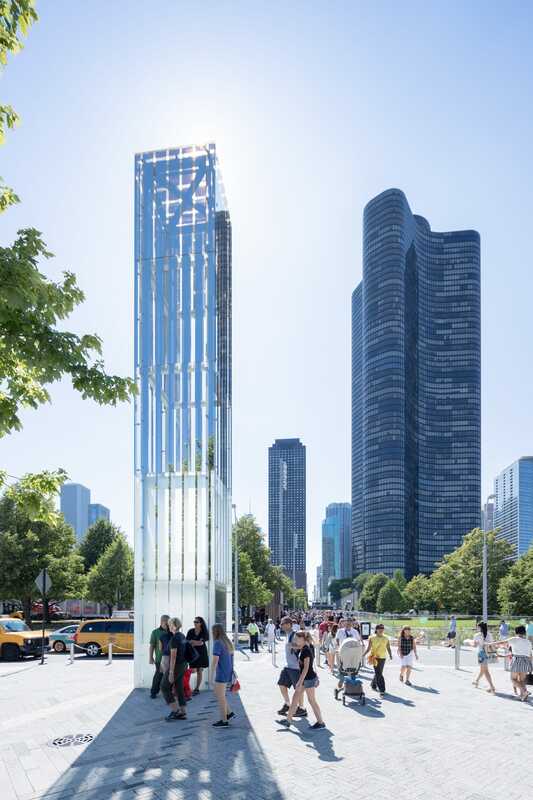 Viewed with the Chicago skyline in the background, the Info Tower playfully mimics the larger towers beyond. 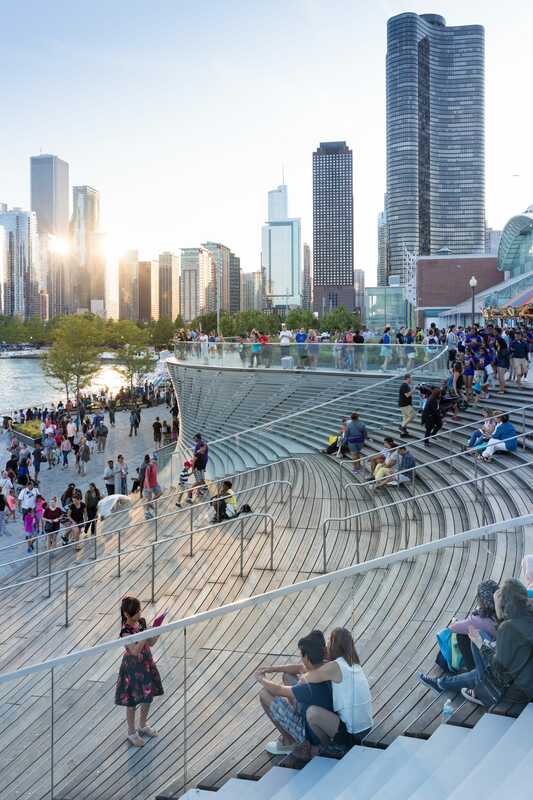 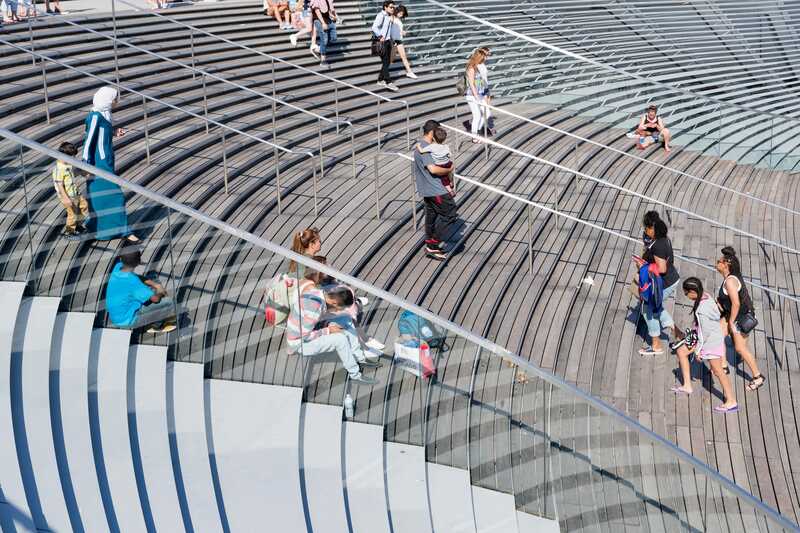 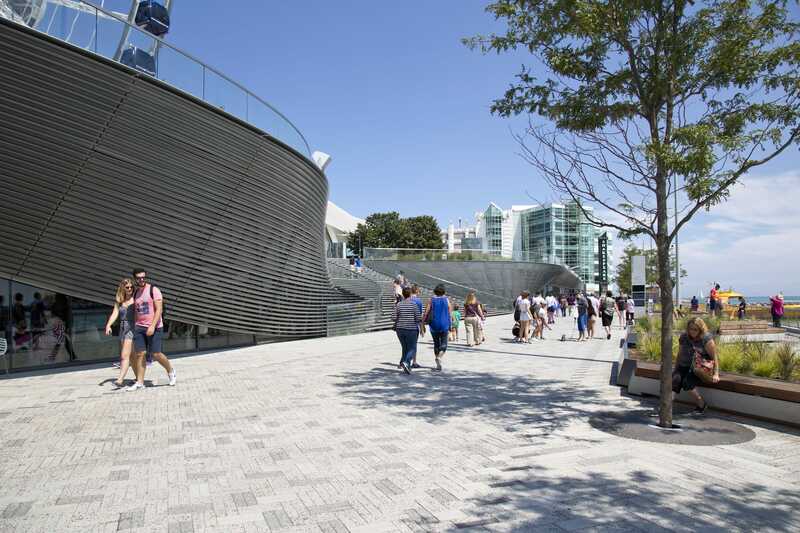 As the centerpiece of the South Dock Promenade, the Wave Wall is a louvered façade that morphs into a grand stair, inspired by the Spanish Steps in Rome. 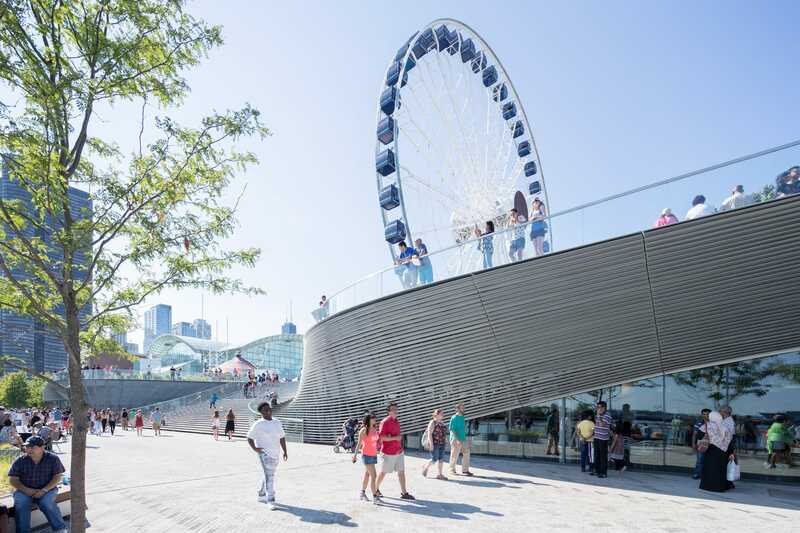 It connects the South Dock to an upper level amusement park in one continuous and dramatic social space with south facing views of Lake Michigan. 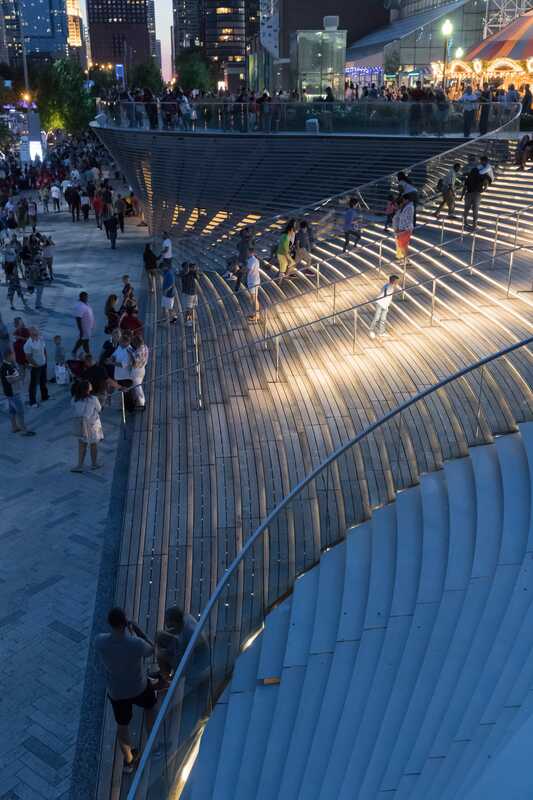 As the steps rise and transition into louvers, they reveal access to 30,000sf of retail spaces below. 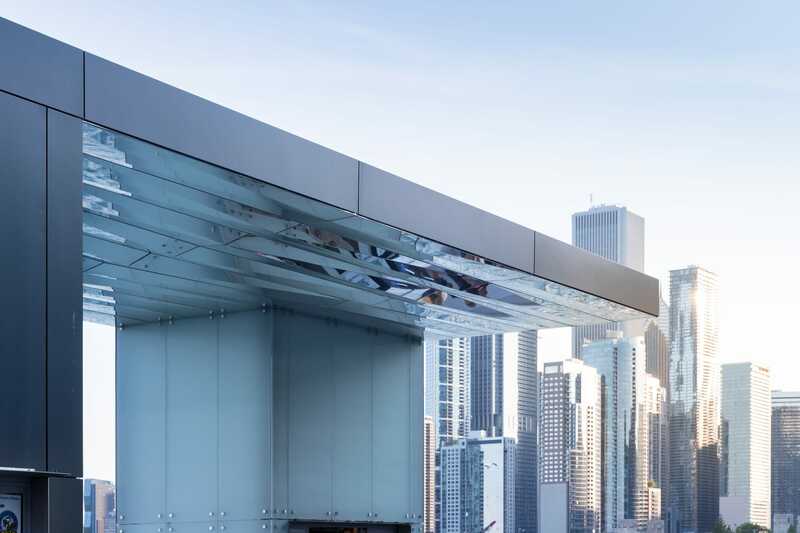 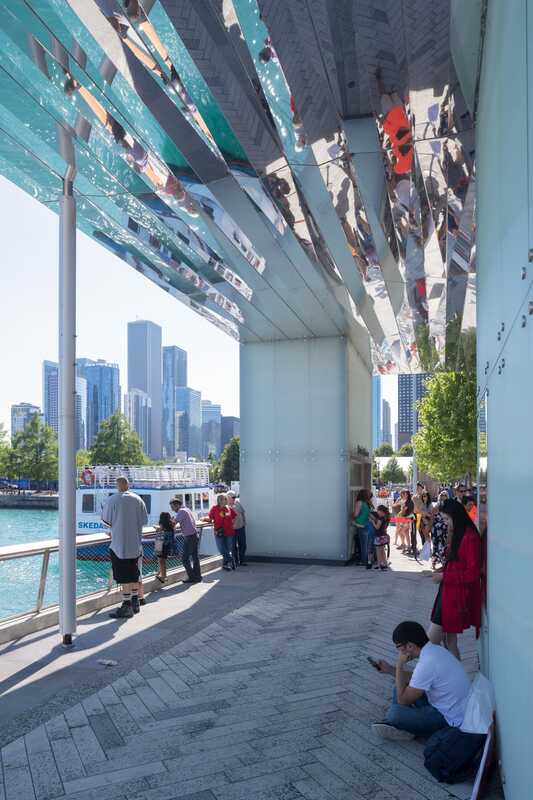 A series of Lake Pavilions combine boat ticket kiosks with large undulating polished stainless steel canopies that reflect the rippling water of Lake Michigan back onto the dock. 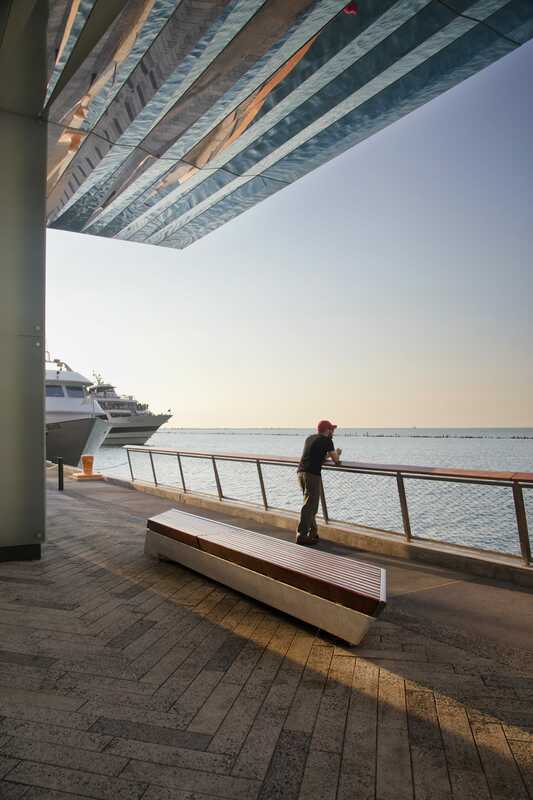 They provide moments of shade and shelter and give cadence to the pier. 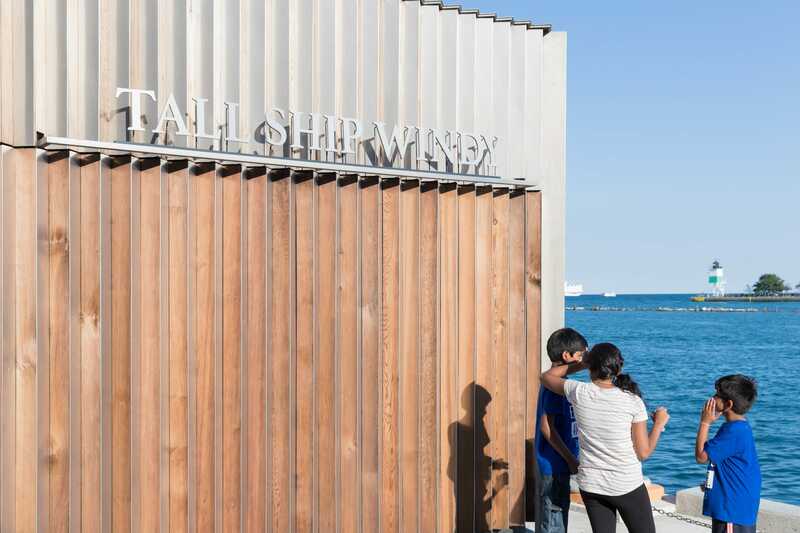 A series of small kiosks dot the water’s edge and are designed to reflect their context. 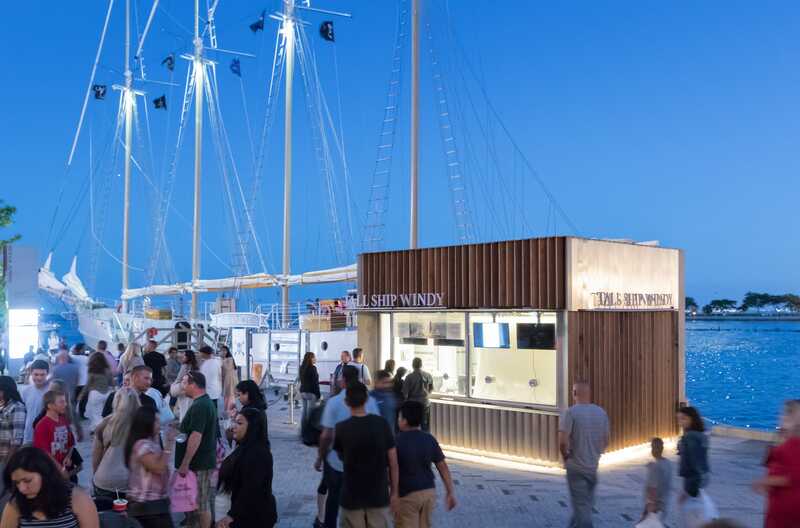 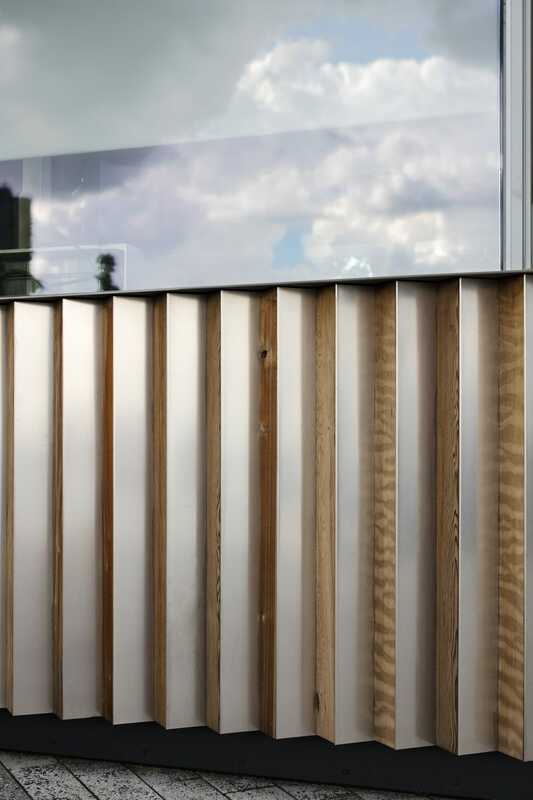 The kiosks are clad in custom corrugated panels that alternate between wood and polished stainless steel, so that approaching them from one direction yields a different material expression than in reverse. 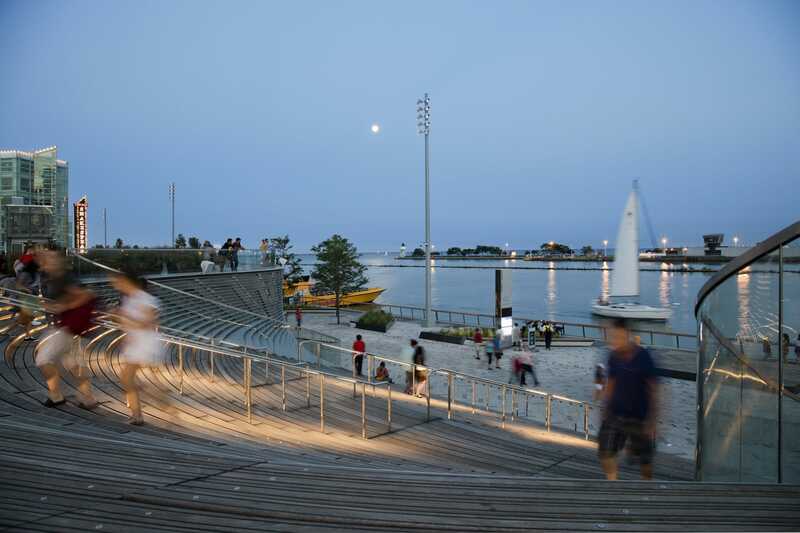 Arriving and departing the pier is a dynamically different experience. 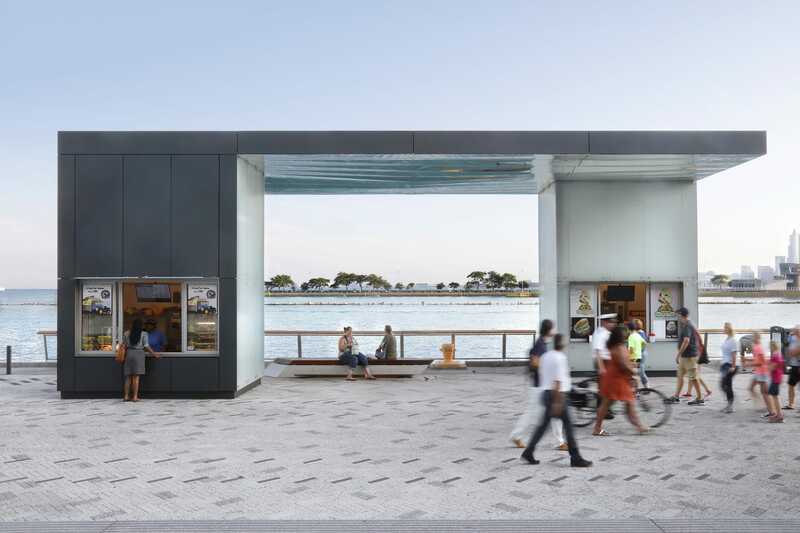 Awards: 1st Prize, International Competition; Architizer A+ Awards, Finalist, Mixed-Use Commercial. 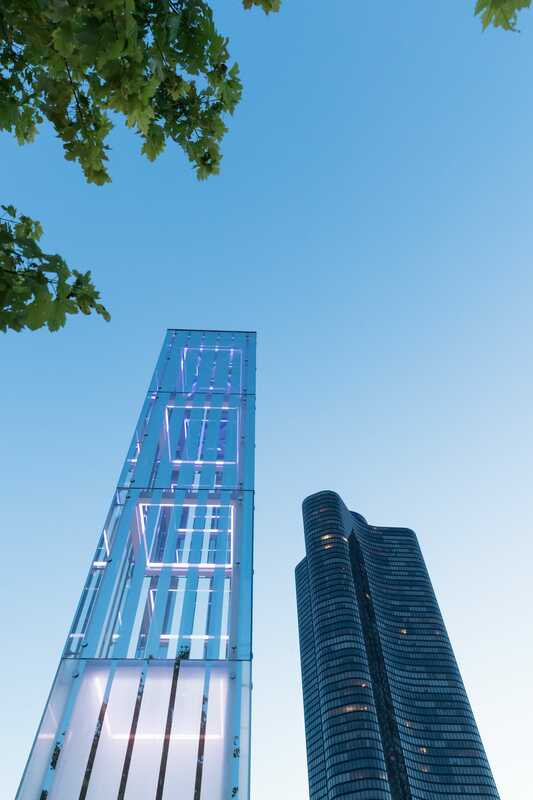 nARCHITECTS: Design Architect and Architect of Record. 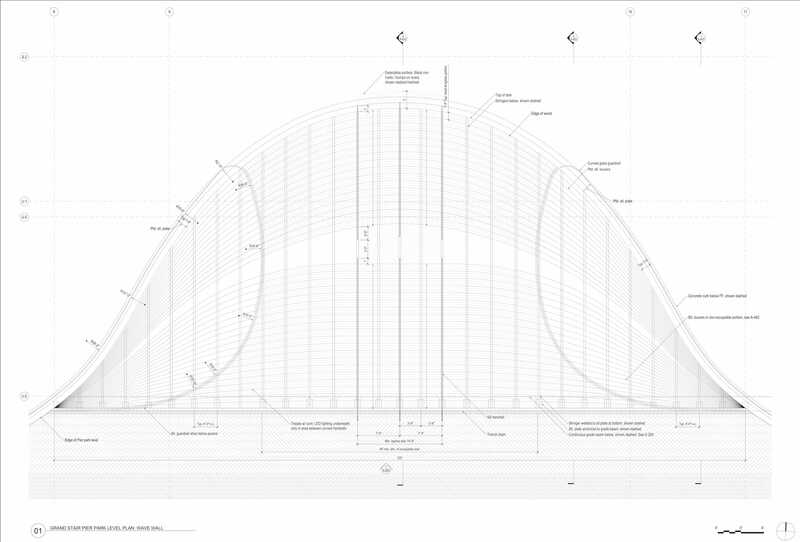 Design Team: Eric Bunge, Mimi Hoang (Principals), Marc Puig (Associate, Project Manager), Albert Figueras (Associate, Project Lead), Gabrielle Marcoux, Lily Zhang, Joshua Feldman, Matthew Wilson, Alexis Payen, Alex Tseng. 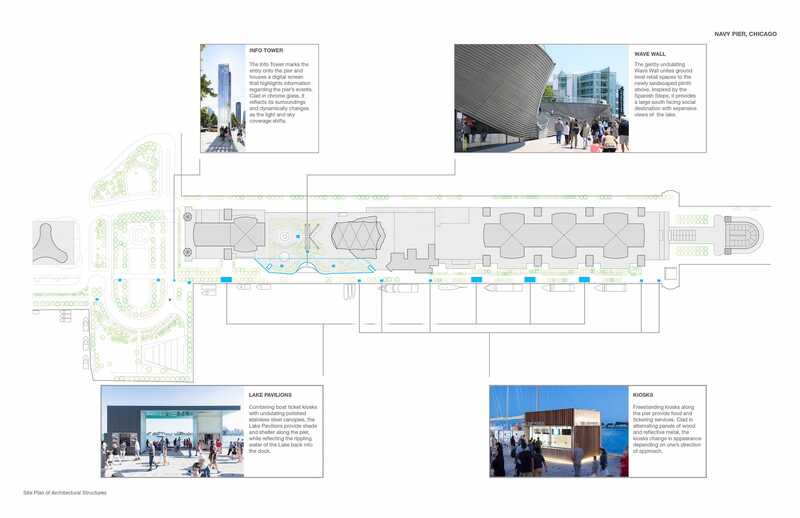 Competition Phase: Eric Bunge, Mimi Hoang (Principals), Lily Zhang, Chris Grabow, Brantley Highfill.